Oregon, with its dense coniferous and deciduous forests, is home to a wide variety of native shrubs. Some are huge, towering upward of 15 feet, while others are only a few inches tall and creep along the ground. These native plants thrive in the temperate climate that most of Oregon provides, and all are good choices for the home gardener. This showy shrub prefers to be planted in full sun in Oregon, although it will also grow well in partial shade. 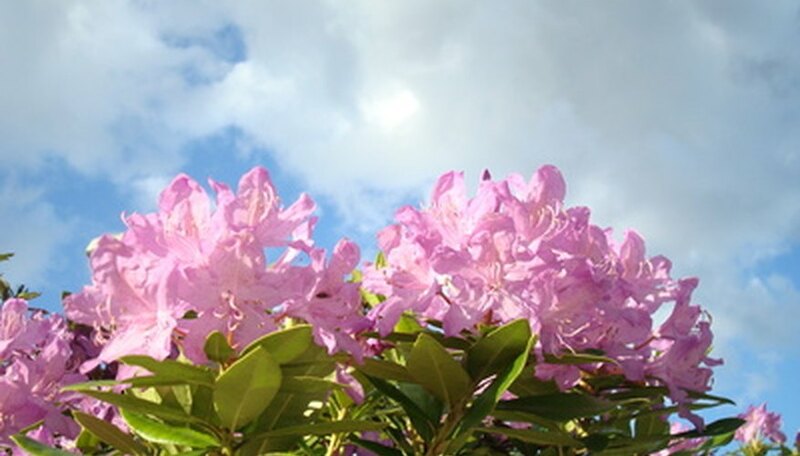 The pacific rhododendron can grow up to 20 feet tall, but usually stays between 6 and 12 feet. The flat, green or rust-colored leaves remain clinging to the bush through the winter and are replaced by new growth every two or three years. The shrub blooms with large clusters (up to 12 inches across) of five-lobed flowers and is usually found in the coastal areas of the state. The Oregon viburnum is a species of viburnum native to the state. This shrub has broad leaves that drop in the fall. It is a medium-sized plant, averaging between 3 and 12 feet in height. The oblong leaves have ridged edges and are dark green on top, and lighter green underneath. Oregon viburnum grows in full sunlight or partial shade, and blooms in the spring with small clusters of tiny white flowers. The multiflora rose is a deciduous shrub and is considered an invasive species in Oregon. This plant is extremely hardy and can tolerate just about any type of soil. This shrub thrives in full sun. The graceful branches are long and arching, and can climb up a structure, although the plant usually remains in more of a shrub form. The average height of the multiflora rose is 10 feet, with a 15-foot width. In the summer, the multiflora rose blooms with fragrant, beautiful white flowers. This deciduous shrub is named for its edible, salmon-colored berries, although the berries can also be purple, depending on the variety. The salmonberry shrub grows up to 10 feet tall and is very vertical rather than sprawling like many other shrubs, often forming screens. The leaves are a glossy dark green, but the true standout of the plant is its flowers, which are red or pink and often appear before the leaves uncurl. The salmonberry is also noted for its ability to thrive in very soggy soil. In the wild, it is often found growing in the marshy land along rivers and streams.